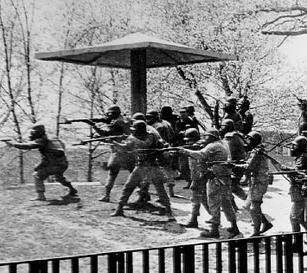 May 4, 1970: Four students murdered, nine wounded by National Guardsmen, on the campus of Kent State in Kent, Ohio. Allison Krause, William Schroeder, Jefferey Miller and Sandra Scheuer were killed in the 13 second fusillade of 67 shots fired by the Guardsmen, after an order to fire was given. No one has ever been held accountable for this massacre. And no one will ever be. But we won’t forget. For YouTube videos of the massacre, go here. “Four dead in Ohio,” sang Crosby Stills Nash and Young. It was an event and song that described a generation. It became an anthem to many, as a remembrance to a horrible, murderous day – a day when the Vietnam War came home. “The chickens have come home to roost,” the saying goes. The National Guardsmen beat us to it. How the Hell Did Things Get So Bad …. In 1968 Richard Nixon was elected with his promise to end the Vietnam War, a war that President Johnson had beefed up substantially after taking over when JFK was assassinated. Significant anti-war protests had been occurring and increasing in intensity since 1965. They grew so intense that they forced Johnson to bow out of the ’68 presidential contest. With the Democrats themselves split over the very issue of the War – a split bloodily manifested in the streets of Chicago during Mayor Daley’s romp against demonstrators – Nixon was able to nudge past Hubert Humphrey and enter the White House as the “peace candidate”. But when Nixon actually expanded the war in Southeast Asia by invading Cambodia / Kampucha in the early Spring of 1970 – the kids – the college kids who were the foot soldiers of the anti-war movement – went ballistic. College and high school campuses across the nation exploded in protests. 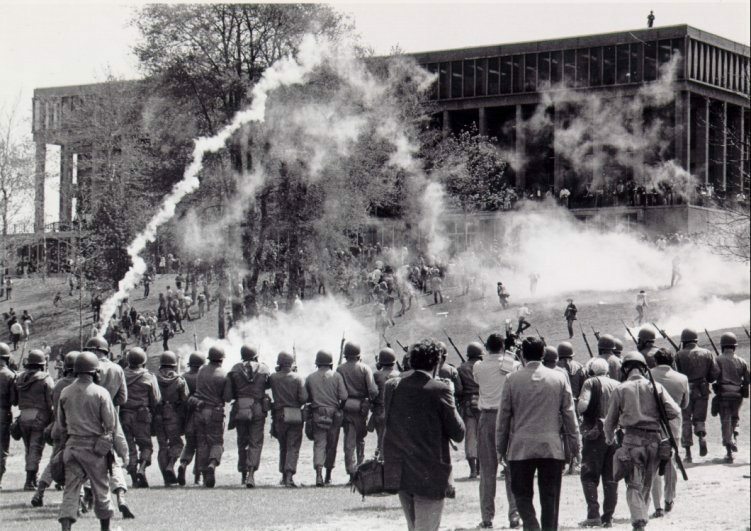 Sit-ins, take-overs of campus buildings and ROTC facilities were commonplace. We do remember. Please save a quiet moment today for these martyrs. There is also a commemoration at Kent State today. 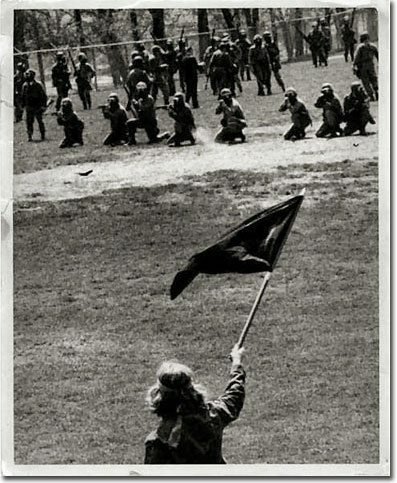 The 39th Kent State Commemoration. Check this out. Now I’m wondering if their song Chicago was about Ken Secor’s piece? Dave – thank you, I was about to post the lyrics myself, but ya beat me to it. Sorry, that city just has such a rich tradition of American history. refer to Black Panther leader Bobby Seale, a defendant in the Chicago 8 trial, who was bound and gagged in the courtroom by Judge Julius Hoffman. The Chicago 8 were on trial for supposedly causing riots at the 1968 Democratic Convention in Chicago. All charges and/or convictions against them were later dropped or overturned. The Skolnick Report – the official report of the commission assigned to access the Chicago riots – determined that it had been – in their words – “a police riot”. 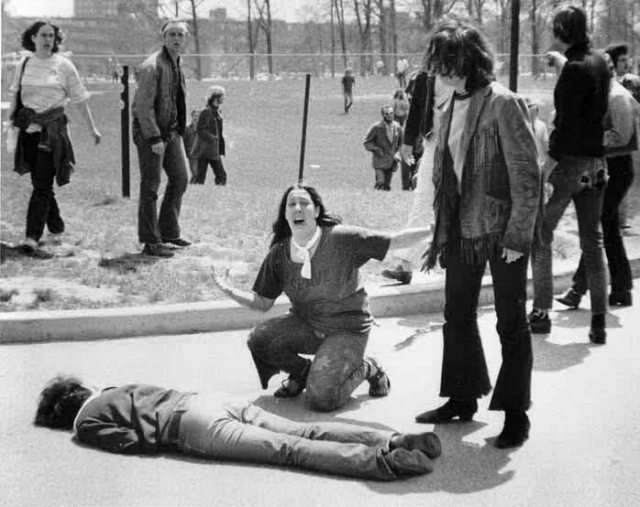 As I look back & reflect on The Kent State Killings I’m both embarrassed and proud to be an American. Embarrassed because the world got to see my government use live ammunition and open fire on fellow Americans who were doing what was expected of them and that is protesting a government that was not listening to its people. And proud of what happened afterwards. A huge protest all over the country with the pinnacle being in Washington DC. There was no apathy and there was no fear. The incident galvanized it for me. It was Us against Them and the law was on our side. The more they clubbed us and the more pepper gas they used on us the more it became apparent that they had lost. Kent State was the epiphany for me. I will always look at my government with wary eyes. For me that’s what the framers of the constitution provided for and that’s my obligation as an American. 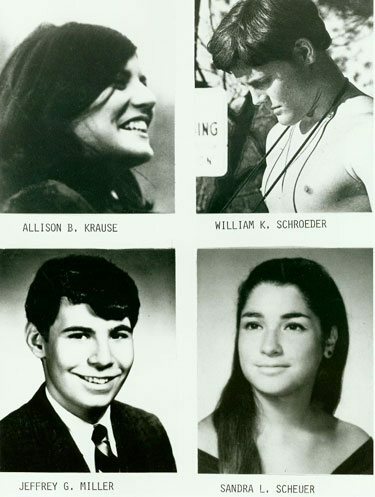 Allison, Jeffrey, William and Sandra will never be forgotten. Neither will Nixon. Time for me to finally move on. It’s been a long time coming, but the change will do me good. Peace and love be with you KSU. We were going to re-post this tomorrow but realized it was already the favorite page of our readers today, other than the home page, so up it went. Rest assured that generals on a Hollywood stage telling us how well a war is going, then Ollie North interviewing soldiers in clean blood free uniforms will never excite the lazy public enough to cause a Vietnam style protest. That is why the merchant bankers set up an arranged marriage between corporate media and the Military Industrial Complex. The New Pearl Harbor and the FAKE war on terror would never have survived a Vietnam era press. I was paralyzed with fear and a deeply visceral sense of foreboding that only deepened when I saw that iconic picture in the evening news paper and on the news. It was unimaginable to me, it had never occurred to me, that our own government would turn loaded rifles against its own citizens, its own children. It was 1970, and a long hot summer lay ahead. That image of Mary Vecchio kneeling beside the dead body of Jeff Miller is burned into my brain. It is 2010 and that photograph is no less arresting today than it was then, except that today I am looking back through time at my own younger self in that image of Mary Vecchio’s raw grief. This is what it meant to bear witness to the unimaginable. Dropping to one’s knees in shock, opening one’s arms in supplication to what? The agony in that face. The still body in front of her. At this moment, I think of Greek tragedy and I feel terribly terribly old. On May 4 1970 I lost my innocence. Up to that point I had been absorbing and thinking about issues and ideas that were completely at odds with those of my own upbringing. Something coalesced inside of me that day that would become seminal to the woman whom I have become. The death of Allison Krause, William Schroeder, Jeffrey Miller and Sandra Scheuer was a waste of four young lives. Never again. Interesting memories of my generation, not necessarily pleasant. I was in an engineering school at the time and editor of the school paper. In my steel design class the professor decided the discussion class would be on my editorial instead of steel. I wasn’t real popular with a bunch of engineer types that week. I have no regrets many of the students felt different when there number was called. Well & good, but NO ONE seems to remember Jackson State, Mississippi, 15 May 1970, 2 students killed & 12 wounded, same situation, ‘ceptin’ the students were black. Once again, the racism that infects us all makes itself known. Why not Kent St AND Jackson St??? Incidentally, 58% of Americans, including substantial numbers of faculty & administration & even parents of the students, approved killing the students. WAKE UP, America!!! HAH! Never………. Not true, Joe. We posted an article with photos the last two years here on this blog. Do a search. Joe- where were you on May 15 2010? Please tell us how you responded to what happened then. Without all of our voices the truth can never be served. Joe, I think she meant May 15 1970.
i was thinking about jackson state as i was scrolling thru the commentaries. thank you Joe for your post. Well, maybe not no one. There’s a Wikipedia entry [ http://en.wikipedia.org/wiki/Jackson_State_killings ], although that doesn’t have the impact of someone’s personal recollection of how the event was burned into their memory. Joe, I’ll bet you remember where you were. I know this is kind of off topic about the song itself, but is there any info out there as to what became of the Guardsman who gave the call to fire and the individuals who actually pulled the trigger? It’s just a sad fact that they move on with their life despite loss of life they caused. I am always a big supporter of our veterans and very much in the mentality of hate the war but not the warrior, however there are those who went above and beyond what I believe is acceptable. My Lai anyone? And of course this. I know it’s wishful thinking, but I’d like to see these guys show some cajones and come forward and just give their thoughts and feelings despite possible repercussions.